We arrived at the Happiest Place on Earth, Hershey Park at about an hour before the park opened. This would become Michele’s favorite park on the rock n roller coaster tour. It was a close second to me, with Busch Gardens in Williamsburg, VA coming in first. 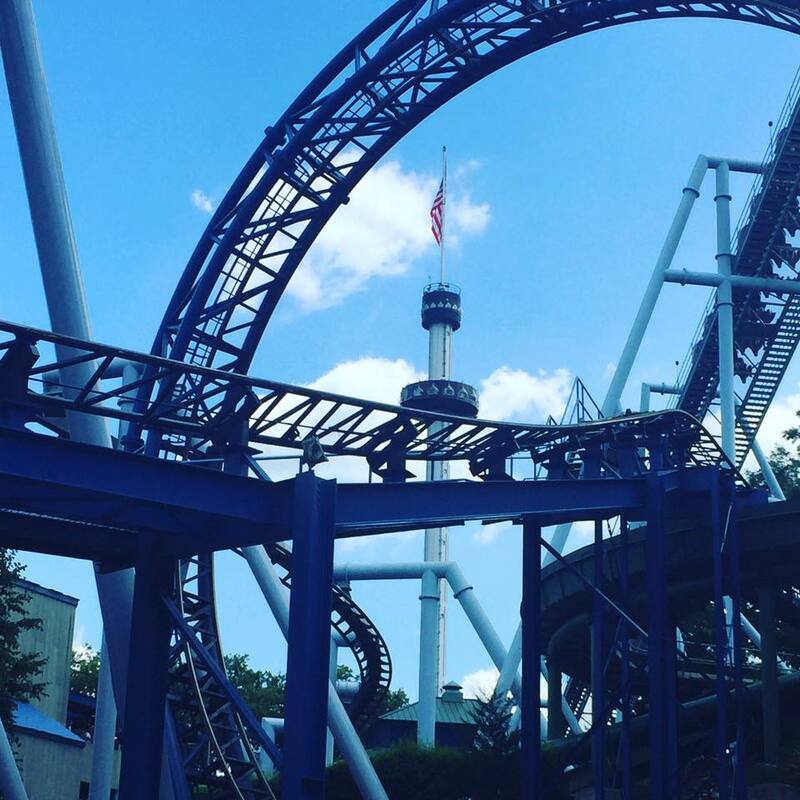 Hershey Park is a real, live Willy Wonka’s World! It has its own town, chocolate factory which I will talk about in a bit, a monorail. a water park and plenty of coasters. Lots and lots of awesome coasters! Our day started on Sky Rush. It almost ended that day too… Skyrush is a ride on the edge with the tallest and fastest roller coaster at Hersheypark. After climbing 200 feet into the air, you’ll touch the sky before flying downhill at 75mph in the winged seat coaster train. 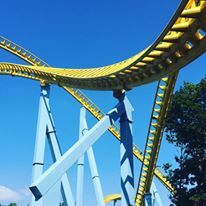 Skyrush will take you to the very edge with four high speed turns, five zero-G airtime hills, and the highest drop in Hersheypark! After that extreme experience and Michele having a great time we headed to the Kissing Tower. 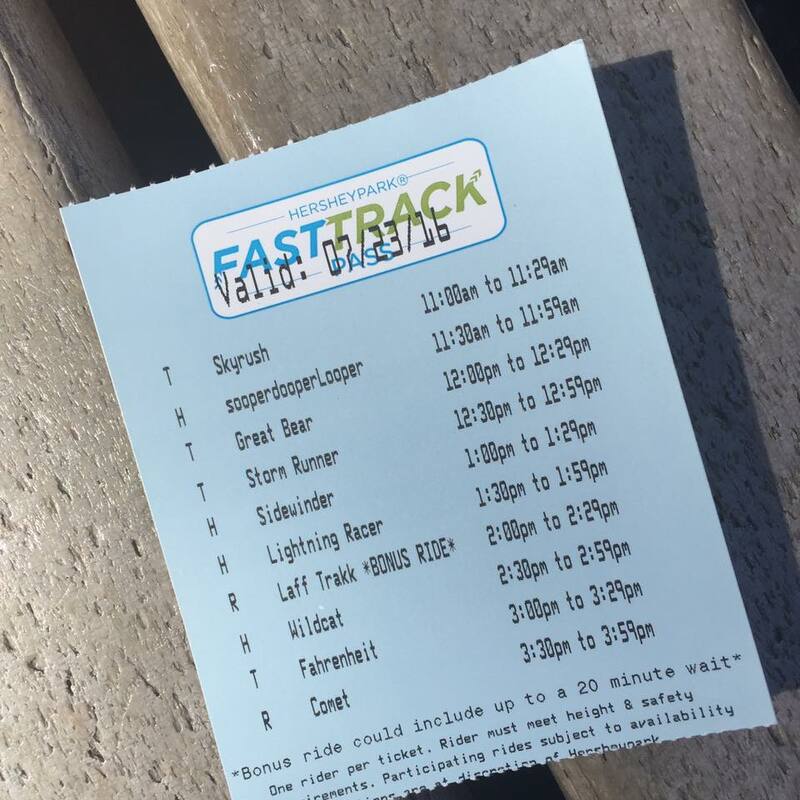 But first a bit about the park’s FastTrack pass. This is the best way ever to enjoy a roller coaster park. You are scheduled at certain times and you just walk up and get on. You even get the sneers like you do in first class on the plane! We headed up to the top of the Kissing Tower and what a view, even of the real life Hershey Park town that looks like it’s right out of a children’s book. Michele got her kiss as we rotated slowly around in the very welcomed air conditioned circular elevator. Our next stop was the SooperDooper Looper coaster, but wait. I’ll let Michele tell the story of what happened next. We finally make it to lost and found, I report the keys missing, fill out the paperwork that the fat lady with horned rimmed glasses handed me while I had Enterprise on speaker phone holding for the next available attendant. How in the heck are we getting keys for this truck? It’s 2o00 miles from where we rented it. All of a sudden a security guard walked in, I looked up and see something dangling from her pinky finger……..in my head I could hear the music from Star Wars when they are chasing the Ewoks……that’s my KEY!!!!!! I snatched the keys, hung up on Enterprise and if the wall hadn’t been there I would’ve kissed the fat lady! Robert here: I maintained my calm. Running through the park, ducking and dodging an nearly knocking over a whole troupe of matchy-t-shirt family reunion ramblers, we made it to the lost and found with little hope. As Michele said, here we were 2000 miles from Denver and we were locked out. I did not even mention to Enterprise that we were taking the truck out of state. Besides who is going to come and unlock the truck on a Saturday in the middle of nowhere? We had a live radio show at 9 am the next morning and we could not miss it. The security guard found our keys on the Sky Rush behind a fence what was just within her reach. She said she was lucky see even saw them. We were lucky they didn’t fall in the lake! Relieved, we continued riding coasters, including Great Bear, Sidewinder, a couple woodies, Lightning Racer and the Comet before we got on Storm Runner. This was my favorite coaster in the park. 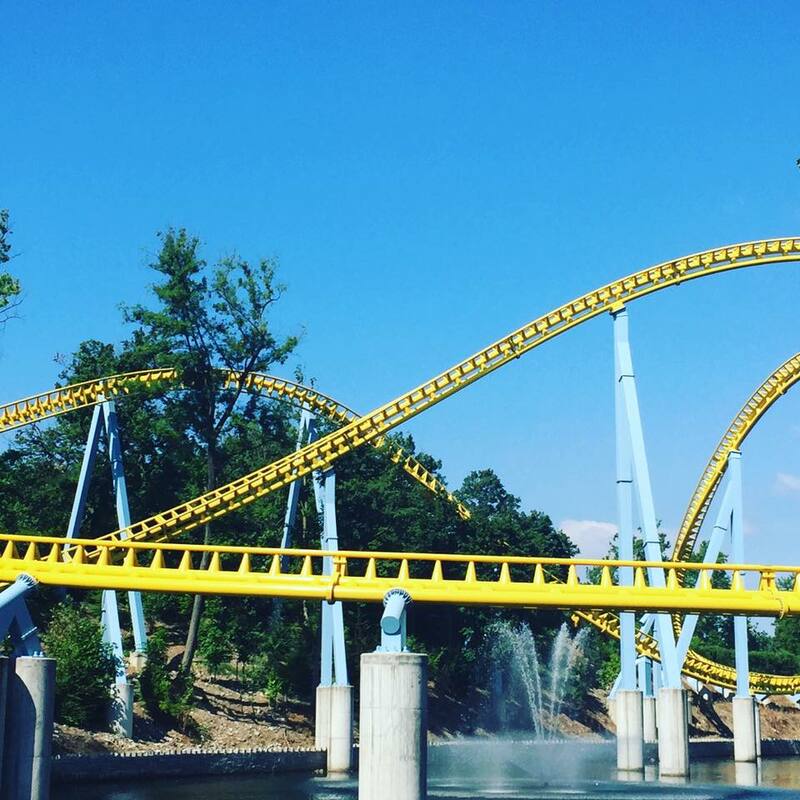 It was a blast coaster that lasted less than 30 seconds.This one-of-a-kind coaster will launch you from 0-72 mph in 2 seconds flat. 18 stories straight up, straight down. And that’s just the beginning. You’ll fly through a 135 foot cobra loop, barrel rolls, and a dramatic flying snake dive. The first hydraulic launch coaster to feature inversions. 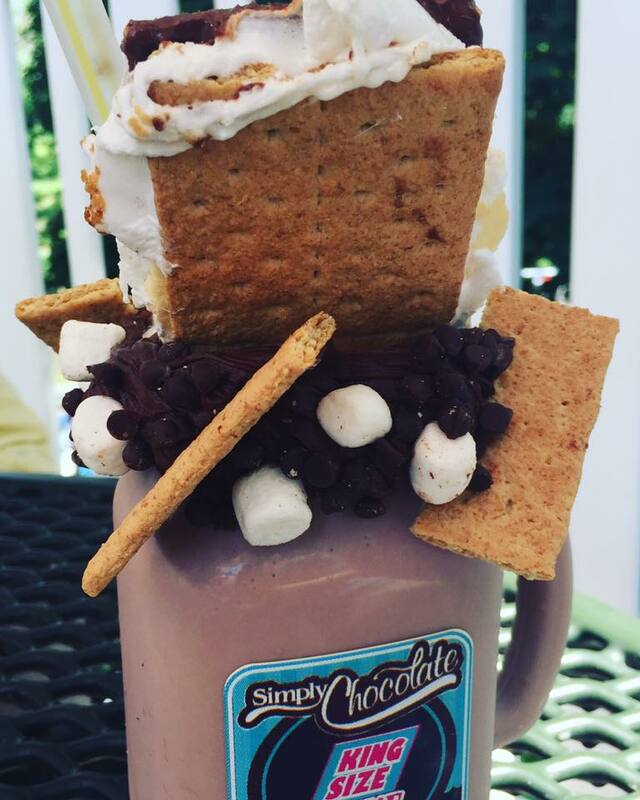 Now it was time for what we truly came for, a king size S’mores milkshake. I saw a picture of this on the Hershey Park Facebook page earlier in the spring and knew I had to have one. It had to be at least 6000 calories and I could barely finish it. It was worth the 2000 mile drive! Our last coaster was an old school woodie, Wildcat and made our way out of the park and into the chocolate factory. Oh my God! This was a place like we have never seen in our lives! It was thousands of square feet of chocolate. There were people spending hundreds if not thousands of dollars on candy. The lines wrapped around the corners. There was even a tour where you could make your own chocolate bar. It was booked through the weekend. As we waited for the shuttle outside there was a kid with a sack he was dragging on the ground full of chocolate that would probably melt before he made it back to the car. As we sauntered back to the truck it was at least a hundred degrees and all the sudden the 6000 calorie shake hit me like Quikrete in my stomach. I knew it was going to be a long drive to New York so I let Michele pilot the truck. I told her I would take over before traffic got bad in New Jersey. I tried to take a nap. As we made our way east we saw a couple of things: one was a guy that bought a billboard looking for a job. What a cool way to market yourself! Here was a guy with a masters degree and a couple thousand bucks that he put to good use and instead of buying some fancy-dancy business cards that would end up in the trash as soon as he passed them out, he thought outside the box and bought a couple hundred feet of advertising that several hundred thousand commuters would see every day. No doubt that dude is employed now. We also saw that in New York they have dedicated turn-outs along the highway that are specifically used for texting. Can you believe it? Texting? What is this world coming to? Hey they did happen to list that it was a 500 buck fine if you are caught texting and driving. We arrived it the little town of Poughkeepsie, NY around dinner time. We ate an awesome brewery and did our laundry at a laundromat at 11pm. There is noting more fun on a road trip than doing your laundry with a handful of quarters. Its a great way to see the locals. We have a big day tomorrow. We are meeting my co-host of The Sibe Vibe radio show that I have worked with for more than three years on-air. She is also known as the Five Sibes Mom. It’s going to be a great day!